Any cricket fan will be familiar with the names Duckworth and Lewis. 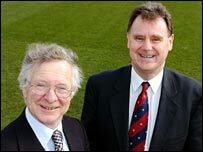 Frank Duckworth and Tony Lewis to give them their full names were the two statisticians who devised a fair method to decide rain-interrupted one-day cricket matches. And now they are celebrating 10 years since the first ICC-sanctioned match to implement the Duckworth-Lewis method was held. It was on 1 January 1997 when Zimbabwe beat England by six wickets after the target had been revised following a rain break. You do not have to be a rocket scientist (but it certainly helps) to understand the intricacies of the calculations but by and large the world of cricket has embraced the method. It was after the fiasco of the 1992 World Cup semi-final it was decided something needed to be done. After a short rain delay at Sydney Cricket Ground, South Africa went from needing 22 to beat England off 13 balls to needing the same runs but from just one ball according to the system in place at the time. Consultant statistician Duckworth said: "I recall hearing Christopher Martin-Jenkins on radio saying 'surely someone, somewhere could come up with something better' and I soon realised that it was a mathematical problem that required a mathematical solution." Lewis added: "It is very satisfying when watching matches that players generally accept revised targets now as fair, in contrast with the previous systems, and that we have made a significant contribution to the history and development of the game." The Duckworth-Lewis method was first used in the ICC Trophy in Malaysia in 1997 and in 1998 was applied in New Zealand, South Africa, Pakistan, India and West Indies. The International Cricket Council adopted the method for the 1999 World Cup in England but miraculously was not needed at all because the weather stayed fine. It was formally adopted by the ICC in 2001 and was used on a trial basis in all levels of cricket for three years before becoming a permanent method in 2004. Duckworth-Lewis is reviewed every three years and in 2004 the Professional Edition was introduced in matches where computers are used. Lower level matches still use the Standard Edition, which is a published list of tables. ICC general manager David Richardson said the method was a success as there had never been much controversy. 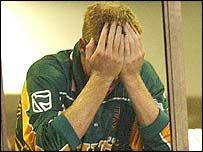 In the 2003 World Cup, South Africa failed to progress to the second round of the tournament on home soil after they miscalculated the score they needed to secure their passage but this was because of their own failings rather than D-L being wrong. He said: "The D-L method has been adjusted and amended over time taking account of the changing scoring trends in ODI cricket. The lack of a serious controversy surrounding the result of a rain-curtailed match is indicative of the method's proficiency. "No one likes it when the result of a game has to be settled by the mathematicians. Cricket, by its nature, is unpredictable and fortunes can fluctuate extravagantly during the course of a match. "However, if one is forced to find an answer to the question 'who is winning' at a particular time during a match, the D-L method gives you as fair a method of doing so as you are likely to get."